I was thrilled this summer when Jerry Gross, my boss for three years at Washington Mutual, asked if he could read the book as it went to press. 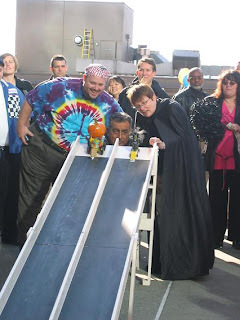 He complimented me then, saying that he (Mr. Tech Gadget, Mr. Cutting Edge Everything) had learned some new stuff in the chapter that covers the online experience. Today he posted the following up to Amazon. 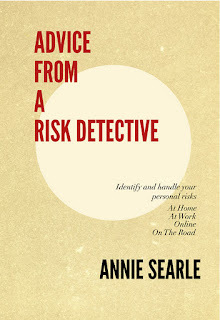 "Annie Searle has created a straight-forward guide to mitigate our personal risks. 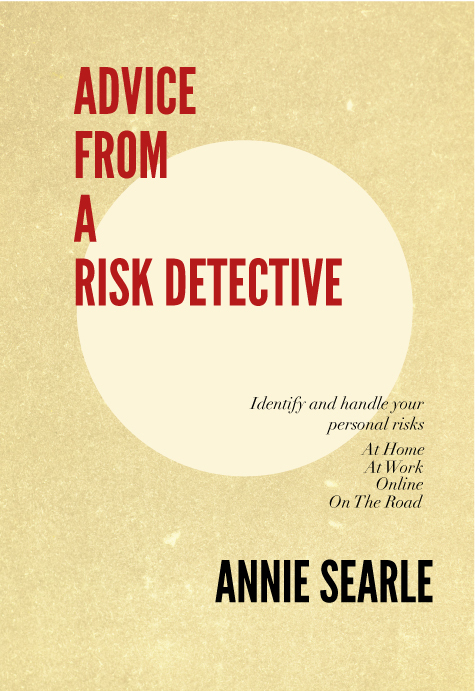 Through her easy-going style of recounting her personal risk journey, Advice From A Risk Detective is structured around four contexts we all live within: At Home, At Work, Online and On the Road. 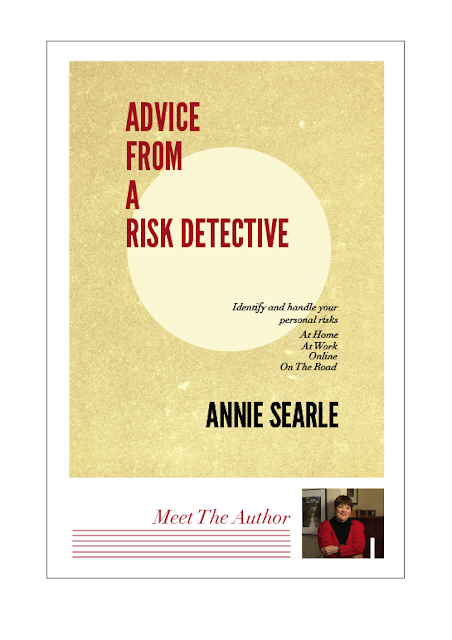 Annie provides practical insight into increasing our "360 degree" view of our lives and how to be proactive. It's up-to-date providing tips on Social Media and use of mobile iOS devices and the Appendix is a great summary snapshot of her key messages and artifacts. There are too many great tips to mention, BUT I particularly found her On The Road chapter particularly helpful in convincing my wife to pack less stuff!" I've heard from so many of you that you plan to put together an emergency kit, but just haven't had the time to do it. My book has a list of kit items, as well as a link where you can just buy a kit that comes in a backpack rather than try to assemble all items yourselves if you prefer. 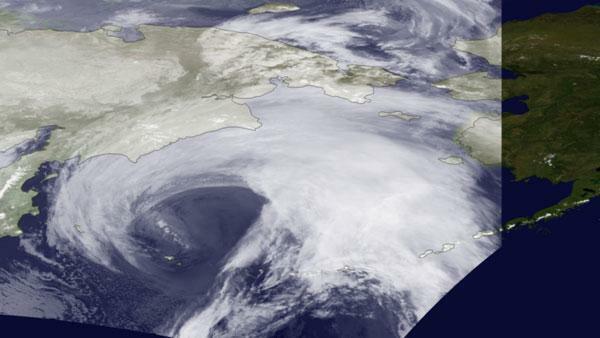 The Christmas Day windstorm we had here in the Northwest knocked out power for thousands. And heavy snows with close to blizzard conditions have already hit the Midwest. Think of such events as reminders to get your own house organized. If you don't already have my book, take a look at a government site in your area, like this one for Seattle. Doing it yet this week means one less item to put on your list of New Year's resolutions. A Washington Post article on spear-pfishing illustrates the problem with not paying attention when you are on the Internet. Evidently Chinese hackers gained access to U.S. Chamber of Commerce accounts through planting a link within an email or on a social media site for the viewer to click on -- which in turns led to code being installed on the viewer's computer. It's very difficult to detect that such code has been installed and the results can be quite damaging. The third chapter of my book is devoted to high impact risks when you are online. One of the most remarkable statistics I note is from a Reuters article indicating that only 13% of Facebook users vett requests to be friends. The Post article points out that the easiest locations for hackers to plant links is within social media accounts like Facebook or Twitter. And if it's this easy to "friend" someone, it's equally easy to plant that code. Most who bank online know by now -- sometimes through hard experience -- that their bank will never ask them to provide their login or password information via an email request. Now we need to apply that same standard of care to other types of communication, where who or what is being asked are unknown. Like with most other risks, being alert to this risk now that it's been identified should help us avoid becoming a victim of this type of attack. Thanks to the Wall Street Journal, we now have a pretty comprehensive list of the risks of going through security and then flying, at least from the germicidal perspective. You'll want to click through to the article if you're traveling over the holiday season. Read this article and take action appropriately. Thanks to our neighborhood blog that is also a "block watch" site, where I've learned of a new risk with holiday package deliveries. Police have indicated that FedEx or UPS drivers are often followed when they make deliveries, and packages are promptly stolen right off the front porch. In some cases, drivers are trying to find more secure locations for the packages at the home, which may mean increased searches to find the packages. Since it's happened more than once in our neighborhood, so it's safe to assume that is happening elsewhere. One of the bloggers for our neighborhood pointed out that Amazon now offers delivery to your home or to the closest secure locker location, noting that such locations have extended hours. If you're not at home in the daytime, you might wish to consider having packages shipped to your office or to another secure location. I just received these photos from the November Hall of Fame Awards Ceremony for the International Network of Women in Emergency Management. I'm proud of the breadth of the awards across both the public and private sectors, and around the world. The women handing me my award in the photo above is Dr. Jacqueline McBride, who organized the entire program and ceremony. Not much else to say except for my motto: "You always get back more than you give." CIO Insider has just published another of their lists of ten tips, and this time it's about Facebook. Take a look at Four Facebook Tips for 2012. My book has both tips and a longer discussion of the pro's and con's of Facebook. The point in both the book and this article is the same: your digital identity can be compromised if you fail to think about what data you are presenting to the world. Our Internet hosting service sent out a security alert earlier today, concerning a new Trojan virus for which there is yet no quarantine. I've posted their message below. Nonetheless, it's a reminder that you should not open emails or attachments from unknown senders, especially if they are already marked as SPAM by filters on your computer. And you should not click on sites that you are not familiar with that may appear while you are in the midst of performing some other transaction on the Internet. Do set up your computer to automatically install security updates as well as any operating system patches. And if you're active on the Internet, it's a good idea to invest in a good antivirus program that will also handle spyware and malware. You can find more details on reasonable Internet precautions in Chapter III of my book. We have identified a potential threat to your email users in the form of a new spam campaign that masquerades as a shipping notification from DHL. Currently, none of the major anti-virus providers are capable of catching and quarantining this message. As such, this scam has the potential to be successful and can have serious consequences. We have manually updated our virus definitions to stop future incoming messages and are working with our providers to ensure protection against this virus. However, you users may already have messages in their inbox. Therefore, we recommend that you take the following action: • Notify all your email users about this threat • Caution your users not to open any attachments from DHL or any unknown sender • Be aware that this is a rapidly-changing virus. Even if your anti-virus provider lists it as covered, you may still be at risk. This time of year, with the holiday madness starting to spin up, there's a good reason to adopt the carpenter's equivalent of "measure twice, cut once." When we get busy, it's hard to stay focused so that items on our list get done properly rather than having to go back for rework. In juggling work projects that need to be finished before the end of the year with a long list of "to do's" at home, try to prioritize then give each of those tasks the right amount of time so that you don't end up with what I call a "do-over." And while you're at it, take a more objective look at that list of priorities once you've laid them all out. You may find that you can eliminate at least half of them if simplification is a goal. I spend a fair amount of time discussing computer backup strategies in my Chapter III of my book. In case I ever thought I was preaching mostly to the choir, I was just reminded by an email from a stressed out colleague that most people still don't back up their data at all. When a computer crashes, those folks are helpless until a technician can attempt to recover their data and perform any other parts replacements or repairs. Sometimes the data can be recovered, and sometimes even with technical support, it's just plain gone because the hard disk in the computer has died. Home computers often have hundreds of digital photos, email and contact information for friends and legal or financial information. Work computers not only contain corporate data, but often also house personal email account information and photos. If you can't be bothered to learn how to back up critical files to an external USB port hard drive on a regular basis, then please do the research and purchase a continuous online backup program from a company such as Mozy or Carbonite. Given the amount of time each of us spends on the computer, it's worth it to eliminate at least one source of high anxiety when your computer crashes. "Some figure more prominently for their ideas and support." On the day of my book launch celebration -- it seems appropriate to reprint its dedication page here. "Many people have made this book possible, and I thank them all. Some figure more prominently for their ideas and support. In particular, I would like to thank Lauren Du Graf for seeing what could make this a better book; Emily Oxenford for masterful technical support; Jesse Brown for his design of the book; editor Molly Martin for her keen eye; and the two men in my life who offer unwavering support of my work, Leroy F. Searle and James H.S. Searle." Three of these people have worked with me since 2009, to create and launch Annie Searle & Associates LLC, my risk consulting and research firm. Lauren and Molly created and refined content and organization of www.anniesearle.com, its website. This past summer, Lauren did the initial edit to the book as originally written, and encouraged me to increase the number of stories in the book and to rethink and magnify the "risk detective" theme. Molly did the final lucid edits to the manuscript, working closely with Jesse on particulars that only a former newspaper person would catch. Jesse designed ASA's logo in 2009, including its internet look and feel and its printed materials. He's done a superb job on this book as well. Emily was ASA's research associate for the 2010-2011 academic year, and provided technical support on the book from inception until it was turned over to Jesse for design this past summer. The final thanks in the dedication are to my husband and my son and should be self-explanatory. It's only when I work with executives who complain about how little they are understood at home that I realize how lucky I am. Tonight I'll have a chance to thank others for their help -- members of my WaMu team, colleagues and clients from the days of Delphi Computers & Peripherals, and those who have so inspired me in my current line of work. There are others no longer with us but who shaped who I am and how I got to be this way -- in particular the poet George Starbuck; Ewen Dingwall, mastermind behind large events like Seattle's presentation of World's Fair and the King Tut exhibition; and Bagley Wright, former newspaperman, art patron and philanthropist. I'll lift a glass in their honor. Sometimes I forget how small the world is. My friend and colleague Cathy Allen was at the Scottsdale conference I attended a week ago. When she heard about the next book I am working on, she introduced me by email to an executive named Marilyn Mason (www.marilynmason.com). Marilyn and I had a chance to speak earlier this week, and I learned a lot. Our discussion included two other risks which perhaps I can cover in my next book, a risk primer for executives. The first is the risk around dying and death, what is usually the absence of a plan or statement of intentions because the deceased just never got around to it. There are so many issues here, including powers of attorney and designation of another to make medical decisions if necessary. Advice From A Risk Detective does not cover this risk, though it does discuss the importance of storing such documents in several places. it's the risk of wealth, whether sudden, inherited, or earned. Each of those situations creates a need for planning, usually with a financial planner. I intend to continue the conversation with Marilyn on a regular basis, and have no doubt that we'll cover even more ground next time around. Some of us get so caught up in presenting ourselves on Facebook or Twitter or Google+ that we re-invent our real lives to look good. Young users don't think so much about looking more interesting or better than they might appear in real lives. They are busy posting details and photos that are often inappropriate and cause for alarm. College admissions personnel, job recruiters and the FBI all spend some amount of time qualifying candidates for a variety of reasons. If you want to get into a good college, don't post photos of yourself drunk or drinking, or in compromising photos. If you want to get a good job, follow the advice for college admissions, and also refrain from expressing political or religious views when you post. If you get arrested, be aware that local and federal law enforcement officials are double checking your profile to see whether you exhibit characteristics that would be of interest to the court. You get the picture. And soon you'll be able to get the whole book. This advice is covered in several places in the my new book, but most particularly in Chapter III. When I checked in, I did what us risk types usually do and checked out the location of the stairs to and from the main floor and exits from the building. Though most hotels provide a map with exits marked out on the back of the hotel door, I like to perform this operation in hotels and with other locations where I am unfamiliar with the layout of exits and stairwells. In emergency management lingo, we call this "situational awareness." I've been doing this for so long that it seems routine, and does not take long. You could pick up this habit for yourself starting any time you're in a large building with more than one floor. In case you cannot walk down and out of a building because of smoke and heat from a fire, the back of your door should tell you to shelter in place, putting wet towels at the bottom of the door and staying low in the room until the firefighters arrive. The fourth chapter of my new book is all about traveling light, and with an open mind. I used the photo above to illustrate what I consider to be the appropriate amount of travel gear, which I carry on to the train or airplane. I've since found a lightweight Coach briefcase to replace the larger and heavier one shown on the photo. And I've just packed everything for the next five days in the grey bag. The briefcase holds a netbook computer, my wallet and a cosmetics bag, a book, work papers and the cables I need to do business virtually. That's it. I even figured out a costume for the second night party at the conference -- I'm going as an author, wearing my "Read Local" tee shirt from Seattle 7 Writers; and I'll be handing out bookmarks to market my book at the same time. I had thought about going as a risk detective, but that would require the magnifying glass, the trench coat and the fedora. A little too much for Phoenix, I think. 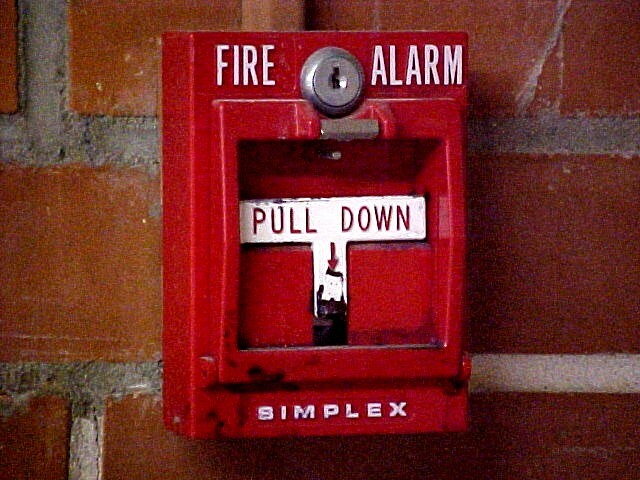 How long has it been since you changed the 9 volt batteries in your smoke detectors? Those batteries operate as backup when the detectors are hardwired into your electrical system -- so that if the power is off, your smoke alarms will still alert you when necessary. Same deal with your flashlights. It's fall, time to also check your flashlights to see if you need to replace the batteries, or stock up on some extras for your emergency kit. Our neighborhood disaster preparedness coordinators, responsible for 312 homes, met last night to calibrate our progress. 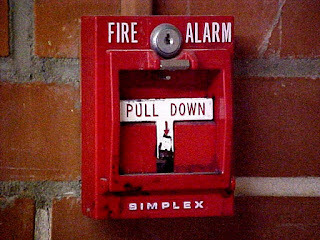 One of the things we talked about were fire extinguishers. If you own a business, someone comes around once a year to check each of the extinguishers for pressure and refill them if necessary. If you've got fire extinguishers in your home, chances are they have never been checked unless you've had a fire. One of the coordinators had a great idea, transferable to any neighborhood: find a service provider and schedule so that all neighbors can bring their fire extinguishers to a central location to have them tested and refilled if necessary. This tip falls into the "small but possibly life-saving" category. The National Oceanic and Atmospheric Administration is reporting that Hurricane Irene is the tenth one billion dollar disaster this year. And we are just at the beginning of the hurricane season! Despite New Yorkers' grumblings that they actually had to go out and spend money on water and canned goods, it's to be hoped that folks wise up -- as my friend Shelby says, "this year could be the new normal." Evidently I need not worry about missing the big storm -- there are more coming. Just need to be sure the book hits the shelves while it's still hurricane season. It's astounding to me that people don't pay attention to directions from their emergency management officials. If we didn't have FEMA and local emergency management, recovery would be impossible in affected areas. Surely the events of this past week on the East Coast has made that clear? Take a look at this news story. How can I market my book to these people? The earthquake earlier this week and now Hurricane Irene make me wish that my timing on publishing this book had been accelerated by a month. Who knows how many people could have been helped with the Emergency Preparation information in the first chapter? Making a plan, building an emergency kit, signing up for alerts on the weather and from your city's emergency management office -- none of those things take much time or money. In the meantime, it's worth it to read everything you can about how this hurricane is handled so you can increase your own level of preparedness at home and at work. Emily worked late into the night to prepare the PDF for the book's reviewers. I sent it on this morning, noting for myself and for Emily a few more refinements before passing it on to Jesse tomorrow. But it's clear as today's sky that this is a real book. Though I knew that all the time, I am sure of it now. Both types of natural events come in different sizes and shapes. Evidently our West Coast brethren have been belittling the 5.8 quake that hit the East Coast yesterday. Once folks in New York and Washington DC figured out that we were not under attack and that it was an earthquake, it became for most merely an inconvenience. It spread a great distance north from its origin in a small town in Virginia. Please note that no one on the East Coast has been trained to "drop, cover and hold" for an earthquake. 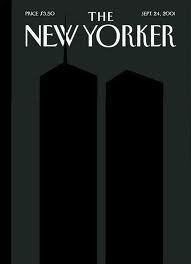 It's doubtful that you could keep anyone in Manhattan working inside a high rise when they remember 9/11. This weekend, the East Coast is looking at a plausible second event this week and making Hurricane Irene preparations. If you're a business located on the East Coast, this ComputerWorld article titled "Hurricane Earl: Tips to Batten Down IT" from last fall might be of interest. The advice in it from me and others is as good now as it was then. I was wrong when I said last week that the worst was over. There's always always more. A bit of exhaustion accompanies each phase of rewriting. It is as if energy rises or falls according to what I am asking of myself and others. Intense energy was required to drive through manuscript revisions -- thirteen of them from when the counter was turned on -- via three different sets of critical eyes. Molly did an amazing job on the edits, which took more than three times the number of hours I had estimated. Next round is Emily's, to fix technical issues and prepare the manuscript for its two trajectories, described in the last post. Jesse Brown has a front cover design we like a lot. He will be working on the interior design, which while the book is out for review. Then the last step before sending it off to CreateSpace will be to design the back cover of the book, selecting blurbs and nailing other details down. We're still ahead of schedule. I say that somewhat tentatively.